Beading Arts: Two handmade necklaces return home! Instructions and step-by-step photos for making both of these necklaces are in the current issue of Jewelry Crafts Magazine (Jan/Feb 2007). Floral Fantasy is a really fun piece that's a lot faster to make than it looks like. 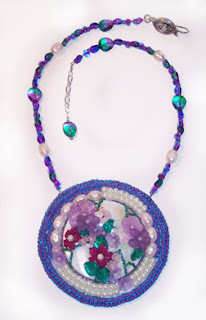 It uses bead embroidery techniques, but because they're worked dimensionally around a shell piece with holes drilled in it, you can stitch it up much faster than most handmade bead embroidered necklaces. Cave Paintings 2 uses handmade sand casted African trade beads, but any large roughly finished beads will do. 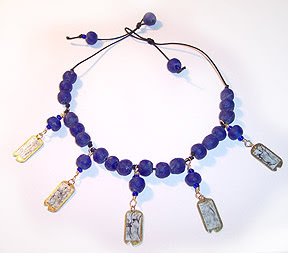 These are mixed with brass dog tags that have cave paintings from Lascaux France applied to them.